On 6 March 2018, PNG’s Prime Minister Peter O’Neill reportedly announced a shift from limited preferential voting (LPV) back to the first past the post voting (FPTP) system in PNG’s national elections. This announcement will likely spark intense debates about the pros and cons of each voting system. It also raises questions about women’s political representation in PNG. For decades, debates about women’s political representation have waxed and waned depending on who is in parliament, who constitutes the women’s lobbying group, the state of the national women’s machinery, funding availability and – because most funding is from donors – the priorities and direction that donors choose. Early debates revolved around a proposal to invoke a provision in the PNG Constitution to nominate a woman’s representative. This debate culminated in 2009 when the Somare-led government backed Dame Carol Kidu, who was then a member of the cabinet, to put a motion to parliament for women to be nominated as representatives of parliament, based on this constitutional provision. The parliament rejected the proposal, but it was an important moment because it deepened the debate about legislative reform and paved the way for progressing the drafting of the Equality and Participation Bill (also referred to as the Women’s Bill). After many months of sustained national debate, consultations, lobbying and drafting, women scored another victory on 22 November 2011 when the parliament voted to allow the 22 reserved seats for women under this bill. Leading up to the 2012 national elections, the leaders’ summit agreed to support reserved seats for women in parliament. The process involved a concerted effort, with the sole woman MP Dame Carol Kidu as the champion, pulling together a diverse range of stakeholders and securing the support of a significant number of male members of Parliament. Some argue that this national backdrop may have contributed to three women winning seats in the 2012 national elections. During the next parliamentary term, debates waned. Dame Carol Kidu retired. The passing away of the late Scholar Kakas, the President of the National Council of Women (NCW) and a vocal supporter, created another vacuum in advocacy. The three women members of parliament reportedly withdrew their support for the Women’s Bill. A proposed bill in 2015 to legislate that ten percent of candidates endorsed by political parties be women, was met with mixed reactions by members of parliament, including one of the women MPs. The Government of PNG and the development partners need to move beyond short term interventions to implementing a well-planned and comprehensive intervention package with the overall objective to create a level playing field for women in PNG politics. What will constitute ‘moving beyond’ the status quo of donor interventions is debatable, but the realities for women who want to enter national parliament will remain the same for a long time. The failure to push legislation through stems from people’s perceptions that it is a donor-driven agenda. Some say that the debates around the women’s bill served the purpose of meeting the needs of the international community. Three Pacific women leaders interviewed in this report offer advice, caution against overestimating the ‘relevance and effectiveness’ of donors’ support, and suggest that donors take a long-term approach that includes widening the scope of support beyond national political representation to include other areas where women exercise public leadership. Dame Meg Taylor, Secretary General of the Pacific Islands Forum Secretariat, on International Women’s Day reflected on a need to move beyond standard measures of women’s political participation. For the PNG women’s movement, unapologetically owning and leading the agenda for women’s political representation will be important in the lead up to 2022. This is a highly political and contested space – after all, it is politics! Pushing for women’s political representation requires PNG women to take a moral, political, social and cultural stand against the prevailing norms in PNG and against perceptions that they are simply the vessels of an outside agenda. For many PNG women who decide to engage in this space as researchers, activists, or political candidates, their decisions come from a conviction that women’s political engagement is desirable personally and collectively. They do so breaking ground in navigating a long path that also extends national debates into their homes and social relationships. To overplay the role of donors undermines the leadership and conviction of the many Papua New Guinean women who have been involved in this journey – as leaders, advocates, support workers, volunteers, employees of international organisations, members of political parties, journalists, and as candidates in the national elections. And yet, donors do still need to make some funds available to Papua New Guinean women and institutions, especially the younger generation of women who may wish to pursue this agenda. This will require donors to innovate how they provide support, and take a lower profile. Donors need to know who is available, people’s different strengths, and when to use them. This is a space where the lines blur between the researcher producing the evidence base needed for women’s political engagement, political activism and lobbying, and actions – of women candidates, legislative drafters, and lobbyists. All these actors are important for change, but each has a unique combination of these attributes. For example, a researcher might know how to consolidate complex findings, but a political activist or lobbyist knows which doors of parliament to knock on. Only a woman with a hunger to enter national parliament will put her hand up to contest, but without strong activism to create awareness that women matter, her aspirations diminish. Men matter! History has shown that Papua New Guinean Prime Ministers, especially Michael Somare and Peter O’Neill, are willing to work with women on this issue. They need support to frame these debates to the wider community, and especially to their fellow MPs. An opportunity currently exists because Prime Minister O’Neill has indicated his support to revisit the debate about legislative reform for women’s political participation. Peter O’Neill’s recent announcement about a return to the FPTP voting system hints at how he envisages the conduct and outcomes of the next elections. In this parliamentary cycle, the field of donors in PNG has changed compared to the past decade and, given the traditional influence of donors in this space, new donors may weigh into the debate. There will be implications for the outcomes of women intending to pursue candidacy in the national elections. Being prepared to change tactic, to revisit old and spark new debates, including boldly taking up Prime Minister O’Neill’s support to revisit the legislative reforms, is a necessary part of moving beyond the current situation. I write as a woman, a mother, an aunt, a sister and a cousin to many; an observer of politics; a political scientist; and an advocate of greater participation of women in political office and other spheres of societies. I contested public office, though not in PNG, and I did that for a number of reasons but essentially, I saw that our chamber was unrepresentative of the community it was located. I knew many of the middle-age white male who sat in that chamber, and I knew the few women who sat there too. I attended the events that these representatives attended. I attended their sessions in the chamber. As a political scientist, I understood what they stood for. As a human and a women, I know why it is important to have a parliament that is representative of its locale. The situation in the chamber and outside left me wanting. When you have women in decision making positions, you get an insight that encompasses the ideals of those less seen or heard. These ideals translate to better policies, better communities and better outcomes for all. Women will put the needs of the country before their own. There is no need to fight for power. But there is a need to seek a just society, a society that embraces all its citizens and appreciates that when men and women share the full responsibility of building their families, their homes and their nations, they co-create better places. Women do not need to fight for power; fighting for power is ego driven. Women, we leave the fighting to men if that is how they achieve their aspirations. We work collaborative with other women and with men who share the belief that a whole nation served by men and women is better for everyone. For starters, noone needs to fight for power; we seek justice through shared responsibilities of managing the affairs of the nation. We offer ourselves to the services of the nation, we start were we are. As I note in my response to the comments made by Moses Sakai, this is a very contentious issue and everyone will have their own unique story and perspective on the topic and rightfully so. I was very interested to read that you contested public office. Was that in Australia? I really look forward to hearing more about it. You must be one of very few PNG women who have stood for elections outside of PNG and definitely this is something many can learn from. I am also very interested to read that the history of women’s political participation and representation in countries like Australia has also involved a long struggle. For example, I came across this website that after ‘a decade on struggle’ involving resistance against entrenched social and traditional values women in South Australia became the first in the world to vote and stand for parliament. That Bill was made into law in 1895. I feel like it is important for us to know these histories about how our mothers and women before us fought for women’s political participation and representation. It is also sad to see that women in Australia still face immense challenges to get into national parliament and in parliament once elected. It must be even harder for women who are not white to stand for elections in Australia. In PNG, I have immense respect for women who have contested elections. Personally, I have never contested elections and it is highly unlikely that I will ever contest elections. I have been privileged to witness my mother’s journey in this space in Manus and PNG and I know it is not for the faint hearted and the personal costs to women who contest elections are great. I have also had the privilege of witnessing and participating in some of the intense dynamics of the debates and advocacy in the national debates during my work with UNDP in PNG. I think one of the reasons I feel passionate about advocating in this space is because I know that our privileges today have been hard fought and won by women before us. If writing about this issue lends a small voice to this process then I am happy with this contribution. Indeed, this is a collective effort and as I note in the blog article, everyone has a role to play – researchers, activists, politicians, young people. Above all, on PNG soil, the leadership and the desire to fight for this issue will come from our mothers, sisters and daughters and families in PNG. At the end of the day, only history will tell us what the best road is, and only history will tell us whether and how women participate in politics. I remain convinced that there is a need to advocate for women’s political representation at the national level because in some ways it provokes debate at the highest and hardest level of political power. I look forward to hearing more about your journey. That was a very precise comment on ‘Women Political Representation at PNG National Parliament’. As a Papua New Guinean in terms of my understanding of political leadership, it must not be given but it has to be taken. The proposed bill for 22 reserved parliamentary seats for women was totally rubbish. I wish it could not have been proposed and I was happy that it was never passed by the parliament. This is because when it comes to political leadership and representation especially for women, it must not be given on a golden plate. If the Parliament had passed the bill, then PNG would obviously tell the world that women in PNG are not fit or capable of fighting for political leadership like men. Treating women in such a way would make them less effective to become political leaders. A fair political representation is something that both men and women must fight for it and that is Equal Participation. Giving leadership/decision making opportunities to women on a golden plate is totally unfair. If other countries including PNG neighboring countries can have female prime ministers and presidents, why not PNG? Thank you for your comments. This is indeed a contentious topic everywhere and especially so in PNG. First, let me say that I was very happy to read the recent news that the Prime Minister of PNG, Peter O’Neill seems to be putting this agenda back on the political table. An article reporting about his position on this matter can be found at this link: https://postcourier.com.pg/pm-propose-seats-women-parlt/. It is also good to see that this topic continues to be debated in PNG. Let us hope that the PM and our brothers in the PNG parliament will back the women’s fight for reserved seats or other affirmative action. History has shown that the difference between another media statement and pushing this agenda into a sustained national debate depends on many factors lining up. These factors include: political leadership or championship in parliament, a strong advocacy and lobby movement led by Papua New Guinean women, and funding support. Sadly, funding support is usually from donors which means that donors are highly influential in this space so when their own national interests shift this might change the priority they accord to women’s political representation. We witnessed this alignment of stars over the period 2007-2012. Let us also hope that leading up to 2022 the stars will line up for a sustained debate and hopefully running of the bill through parliamentary debates etc so it can be passed in time for the 2022 elections. It will need funds though. I agree with you that political leadership must not be given but it has to be taken. I understand ‘taking’ political leadership to mean contest which includes earning a place of leadership through hard work and earning people’s respect and support in democratic elections. Indeed, politics and political representation is about power – it always has been and it always has been taken. Democratic power is taken – fought, ideally, metaphorically – through contested elections where all citizens are supposedly equal. That said, sadly, it is well documented that women in PNG face daunting challenges to reach political representation. For women, the contest can be more than a metaphorical fight. It can be violent and costly which reflects the day to day challenges women face in many aspects of life. This is largely shaped by norms, cultures, and customs in PNG in which women generally are subordinate to men. Given this situation, I am sure that there are many people in PNG who will agree with your view that the whole proposed bill for 22 reserved parliamentary seats for women is rubbish. However, I also know that there will be many people who will think that this is something absolutely worth contesting or ‘fighting’ for in order to help women take a fairer share of the political power in terms of parliamentary representation. One way of looking at the 22 reserved seats is by using your argument that political leadership is taken not given. If political leadership is taken, then indeed the 22 reserved seats is precisely about women taking a fairer share of political representation. For women to take a fairer share of political power, they will need to advocate, lobby, convince, debate, – or in other words – fight – to win over the support of the all-male parliament. They, and their supporters, will also have to be opportunistic. For example, when the Prime Minister of PNG makes a statement like the one reported in the above referred recent article, women will have to ride on this window of support. This is politics and this is leadership. This is what women have been doing forever whether it is to secure a home for her family, climb up the corporate ladder, fight for a space at the market, or taking a powerful seat in the PNG national parliament. 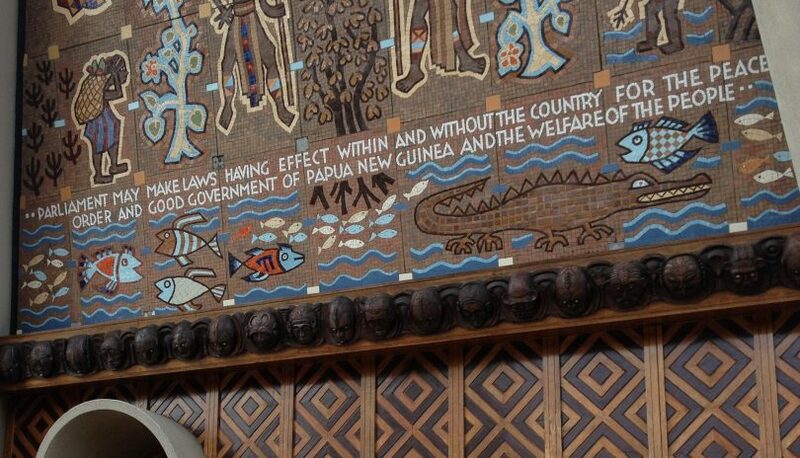 As I mentioned above, however, in PNG this will need some help to align the stars – the PM’s support, a strong advocacy movement, funding and a sustained national debate. Viewed in this way, the 22 reserved seats for women is not giving anyone power on a golden plate but it can be seen as a contest by women to take a fairer share of power. Finally, somewhere out there is a young girl who will one day take a place of power in the national parliament. Her journey, her contest, – her fight – will be her unique story. Certainly, no one is going to give that power to her on a golden plate. But under the current situation, her fight to take power will be multiple times harder than her male counterpart. My fight – my contest – is that by keeping the conversation alive, by hoping for change, by even daring to debate and discuss the 22 reserves seats in itself as process of taking a fairer share of power, we might help keep the fire burning for this girl and future powerful woman. Here’s to hoping the stars align leading up to the 2022 national elections so that we will see a sustained, lively debate and advocacy for more women to take a place in the PNG National Parliament. Let us also hope that there will be funding allocated to enable this to happen. Thanks for keeping me abreast with the issues affecting Pacific Women. Pacific women, if we can not get in the parliament, we should be given the chance to be in the forefront to lead social and economic development projects. I think female managers do better remittances for aid donor projects than would a male. citing Timor Leste model.